PLAYA DEL CARMEN, México — Tournament officials announced today that past major champions David Duval, Lucas Glover and Mike Weir will be coming to compete in the Mayakoba Golf Classic February 22-26 at the Mayakoba Resort on the Greg Norman-designed El Camaleón Golf Club. Officials also announced today that Jhonattan Vegas, the first Venezuelan to win on the PGA TOUR and a 2011 Rookie of the Year candidate, will attend this year’s tournament. So far, the tournament has received commitments from seven major championship winners—Duval, Glover, Tom Lehman, Greg Norman, Jose Maria Olazabal, Nick Price and Weir. Prior to this year, the tournament has attracted a total of 20 major championship winners in the first five years. Weir, the 2003 Masters champion and eight-time winner on TOUR, will be making his first appearance at the Mayakoba Golf Classic. It will also mark the first time Glover has played. Glover won the 2009 U.S. Open and last year won the Wells Fargo Championship for his third career victory. Duval has accumulated 13 career titles, including the 2001 British Open. In 1999 he won four times and was ranked No.1 in the world. This will be Duval’s second start in the Mayakoba Golf Classic. In 2010, he failed to make the 36-hole cut. Vegas will be making his second consecutive appearance. Last year, he finished tied for 19th. The Mayakoba Golf Classic has traditionally hosted a strong international field. In the tournament’s first five years an average of 16 different countries have been represented each year. With a purse of $3.7 million USD, Mexico’s only PGA TOUR event boasts the largest amount of prize money of any golf tournament in Latin America. Daily and weekly ticket packages can be purchased by visiting the tournament website www.MayakobaGolfClassic.com or by calling 01 (800) 212-8969 in Mexico or (855) MAYAKOBA in the U.S.
Weekly general admission tickets are $40 USD while daily ticket prices are $10 USD (or $100 pesos) per person Thursday, Friday, Saturday and Sunday. As is now tradition at the Mayakoba Golf Classic, children ages 17 and under will be admitted free when accompanied by a ticketed adult. Like in years past, the Mayakoba Golf Classic™ will offer two upgraded hospitality ticket options to fans. The Heineken® El Camino and Nextel Fiesta Club will again be available to the general public for purchase. Heineken® El Camino passes offer access to three exclusive venues strategically located at prime viewing locations throughout the golf course, the Heineken® El Camino ticket includes food as well as wine and Heineken® beer. Tickets for the Heineken® El Camino venues are $75 USD per day or $275 USD for weekly passes. The Nextel Fiesta Club provides spectators access to a private skybox on the 18th green of El Camaleón Golf Club, as well as including a complete buffet and full bar. Nextel Fiesta Club ticketholders also receive access to the three Heineken® El Camino venues. Nextel Fiesta Club tickets are $150 USD per day or $550 USD for a weekly pass. Once again, the Mayakoba Golf Classic will provide a complimentary spectator shuttle from the Cancun Hotel Zone to the Mayakoba Golf Classic. 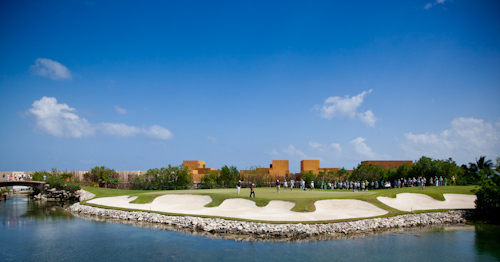 Details about the spectator shuttle will be available on www.MayakobaGolfClassic.com. For more information on the Mayakoba Golf Classic, please contact the tournament office by calling 01 (800) 212-8969 from Mexico or (855) MAYAKOBA from the U.S. or by visiting www.MayakobaGolfClassic.com. The Mayakoba Golf Classic made golf history when it became the first PGA TOUR event to ever be contested outside of the United States and Canada in February 2007. Today, the Mayakoba Golf Classic remains “Mexico’s Only PGA TOUR Event” as it prepares to enter its sixth year. The event is regarded as one of the finest on the PGA TOUR by players, their families, sponsors and the TOUR itself. With a purse of $3.7 million USD, the Mayakoba Golf Classic boasts the largest amount of prize money of any golf tournament in Latin America. Held annually in February, the tournament features 132 professional golfers participating in four rounds of stroke play competition at the Greg Norman-designed El Camaleón Golf Club at Mayakoba in Playa del Carmen, Quintana Roo, in the Riviera Maya-Cancún regions of Mexico. Johnson Wagner, a five-year veteran of the PGA TOUR, claimed the title in 2011, winning $666,000 USD. Other past champions include: Fred Funk (2007), Brian Gay (2008), Mark Wilson (2009) and Cameron Beckman (2010). Previous PostMazatlan’s 114th Carnaval Kicks Off This WeekNext PostJim Budd’s News From D.F.